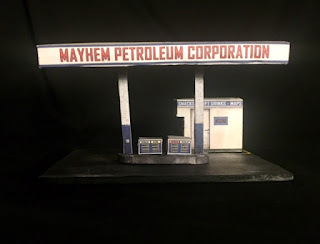 I've just put the finishing touches on a new piece of terrain, a Mayhem Petroleum Corporation Gas Station from World Works Games Mayhem Services kit. 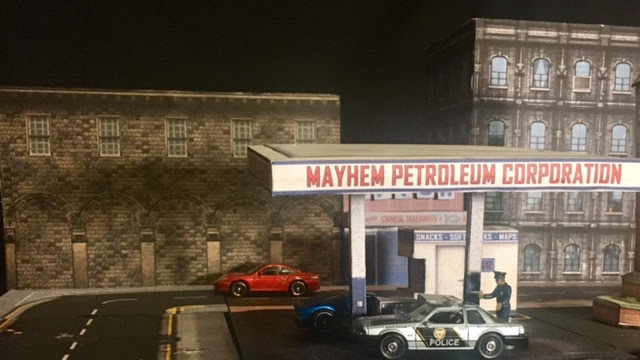 I previously built their Streets Of Mayhem to use as roads and have been very happy with them. In the Mayhem Services you get your choice of three different gas stations to build, I picked the one that looks like a Mobile station. You can also build a free standing propane tank, basketball courts, chain-link fences, and concrete posts. World Works Games last year put in a never ending 25% discount off of everything they sell so today you can buy this kit for only $4.88. This gas station is pretty easy to put together and my only gripe about it is that its footprint doesn't line up with their roads. I think I may trim some of the gas station away until it fits in one. I could also stretch it to two road tiles but then again I may just leave it alone. The gas station comes with two fuel pumps, a Snack Shack, and a price sign which I forgot to put in any of the pictures. Overall I'm happy with World Works Games Mayhem Services Gas Station and if you need one for your table I recommend you check this one out.